What am I thinking? 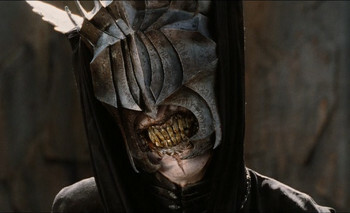 This is the "Mouth of Sauron," from "The Lord of the Rings"
Yet another oracle from the Mouth of Soros is issued, as the Master of Disaster (known to himself, as “God”) explains what is right and how to wrong it. This time, it is about Europe. There, he depicts the relatively stronger nations of that financially incontinent subcontinent, e.g., Spain and especially Germany, as the evil forces of nationalism and perhaps even, perish his thought as he hints: national sovereignty! Ye gads! I mean, ye György! 1. At least one large-scale crisis is impending or worsening. 2. He is actively taking part in the worsening of it, usually intentionally. 3. He and those who gave him the money with which he plays, seek to use that crisis, to further the cause of bringing the world together as one big apple pie, to control, exploit, and devour. In Soros’ March 21st missive, “How Germany can avoid a two-speed Europe,” published in the Financial Times and sent by email to his subscribers, European nations are depicted in classic, Marxist, have and have not fashion. The aforementioned Germany and Spain are among the haves and those nations which are in debt to their banks, the have nots. But, deceit being most convincingly practiced as the art of half-truth, Soros correctly points out that they are all in trouble. And while these nations are in trouble due to their interdependency, in true lying fashion, Soros portrays the problem being the mere fact that these nations continue to be nations at all, acting in at least a vestige of (healthy and manageable) national interest. His solution of course, is for the haves to make it easy on the have nots, by means of a unified bailout structure over all concerned, in a beast called the “European Financial Stability Facility.” (But Soros uses lower case, allowing it to slip through the conscious more easily.) You can read about this EFSF being “official” already, as the policy of NWO-boy, Geithner and America’s Obamunist saboteurs. It was featured big-time by Matt Drudge last December and we spelled it out in Gulag Bound, at that time. Recall as you read that FT piece, that our financial institutions were dealt their worst blow when they were already staggering, in September 2008, due in large part to European banks demanding their mortgage derivatives payments. Understand that America, by means of Congress and the mockingly labeled “Federal Reserve,” then gave them hundreds of billions of dollars we hardly have, thus backed by TARP. Remember also, that this “Federal Reserve” is essentially the kind of European dominated structure of the financial bleeding and manipulation of America that presidents such as Jackson and Lincoln bitterly fought. For the second imperative, [Bank of England Governor Mervyn] King suggested that the U.S., UK, Switzerland, and perhaps Japan might form a temporary new group to jointly develop an effort to bring together sources of capital to recapitalize all major banks. We must also remember the essential objective of György’s warfare: to destroy America for the advancement of his very un-Open Society of globalist collectivism and technocracy, controlled by financial mega-criminals, for which he is both front man and bag man. Make no mistake, the European Financial Stability Facility is a criminally led megabank, for encroaching global empire, fed through the burgeoning, Ponzi-like insolvency bubble of the International Monetary Fund. My request: Pray for that dismantling and a return to the only realistic way for the world to get along with a shred of decency: benign, post-Babel nationalism. There is no healthy internationalism without nationalism, despite what any postmodernist can imagine. The nations function when we are sovereign nations and essentially practice 1:1 diplomacy and commerce with each of the other nations. But, if you wish to read about what happens when globally collectivist and technocratic governance, and global finance do reign supreme, go to the Book of Revelation — and rest assured it will not be allowed to reign for long. Note: the Financial Times requires registration, in order to read Soros’ article. If you wish to bypass that and see the email so generously afforded by His Sorosiness, go ahead and email ArlenWilliams@GulagBound.com. He shouldn’t mind that free-use sharing; it would be for a truly open society, after all.